With A being the darkest color and F the lightest color, and the values of the others falling in between in a gradated fashion. 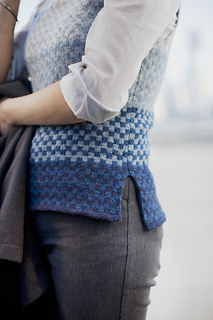 Vest begins with Front and Back hem facings being worked separately. After working the turned facing, you will cast on a steek to work the colorwork sections of each hem in the round; one is slightly longer than the other. Both hems are then joined together into the round for working Body. Body is worked circularly throughout. 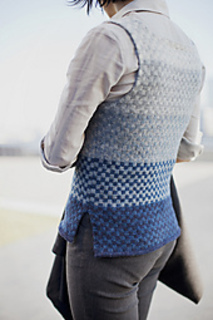 At the underarm, steeks are cast on for armholes, to maintain circular knitting. All steeks are 7 stitches and will be worked in a “checkerboard” pattern on 2-color rounds. Steeks 3 and 4 are created at the base of the neck opening on Front and Back. Steeks are cut, then shoulders are seamed. Hemmed facings are added to the base of neck and armhole openings during finishing.